In my continuing studies of my family history and the Civil War, I now turn my attention to my maternal grandfather's paternal side. Unfortunately, I do not have any lineal Civil War ancestors from this branch of my family tree, but I have found a few more distant uncles who did serve in the war. One of these was Thomas Herald, whom I found at this link which shows him as part of Company K of the 14th Kentucky Cavalry. Thomas was the brother of one of my three-times great grandfathers and the son of my four-times great grandfather, Alexander Herald,a slaveowner and local justice of the peace in Breathitt County, Kentucky. This site notes: "After settling in the Crockettsville area and starting their family, the civil war interrupted their lives and Thomas Herald was enrolled in Company K, 14th Regiment of Kentucky Cavalry on March 7, 1863; and was discharged by reason of expiration of service on March 24, 1864 at Camp Nelson, Kentucky. His record of service shows that he served as a mountain scout and that on a scouting mission to Perry County, where he was exposed to inclement weather and to sleep on the cold ground without blankets developed a chronic health condition and was sent home to recuperate. During this time he was treated by a neighbor and family physician, Dr Anthony Morris and Dr James Riley. Wesley Stamper and Squire Riley were also neighbors in the Crockettsville area." His records on fold3.com state that Thomas enlisted on March 17, 1863 at Booneville, Ky., and mustered out March 24, 1864, at Camp Nelson. It also shows him as 5 feet, 11 inches tall, with black eyes, grey hair and a dark complexion. He was listed as "present" in March and April of 1863 and "absent sick" in July and August of the same year. He was a farmer born in Wilkes County, North Carolina. (He also was the son of a slaveowner, born in what became a Confederate state, though he was in Kentucky for most of his life.) It said he was 44 years old, meaning he was born about 1819, though other records for the family show a birth year of 1813. Perhaps he lied about his age so that he would not be too old to be accepted into service, as ages 18 through 45 were considered "military age." Another page shows he may have originally tried to join Company B, 3rd Battalion of the same regiment on February 28, 1863, but was not mustered into the unit. A comment in the remarks section of this page is not legible. I have seen other ancestors with similar paperwork who ended up in company K of the regiment and a record that notes this unit operated in battalions, so it may have been a case of pre-printed paperwork for one battalion being used at first, then being fixed to standard forms in later record-keeping. An Alexander Herald also served in the war, but several people with that name lived in the area at the time. This link provides a clue about which one it was. It shows that the Alexander in the war was born in 1840, meaning he was Thomas' son, based on family records I have seen. This Alexander was also the grandson of another Alexander Herald (Thomas' father) and the nephew of Alexander Herald Junior. I think he had at least one cousin named Alexandet as well. The younger Alexander also joined Company K of the14th Kentucky Cavalry. Records on fold3.com show that he joined in Breathitt County on December 15, 1862 (the 1890 census shows October 10 as his joined date) for 1 year and mustered in at Irvine, Ky. on February 13, 1863. He mustered out on March 24, 1864 at Camp Nelson. He had received $25 of bounty money, but had last been paid on August 31, 1863. He owed the government $8.99 for "arms, equipment, etc," which a note indicates consisted of: 1 curb bridle, 1 halter, 1 pair of spurs, 1 cartridge box, 1 cap pouch, 1 waist belt and 1 gunsling. He had a clothing account of $78.95. I thought this was what he owed the government for his uniform, but I saw one explanation of service records that said that was what the government owed the soldier. Roger Herald, brother of Alexander and Thomas Jr., was also a private on this roster. His joined send mustered dates and places matched those of Thomas Jr. This means that Thomas Sr. and three of his sons all served in the war all on the Union side. I have to wonder what Thomas Sr.'s wife Elizabeth thought of this, though at least Thomas Jr. and Roger did not join until their father and brother had mustered out of the service. John Herald, bother of Thomas Sr. and uncle of Thomas Jr., Alexander and Roger, also served as a private in the same unit, with the same joining and mustering in and out information. At one point I thought it was strange that men like these from a slave-holding family would fight for the union, but I was wrong. Abolition was not an official goal of the Union early in the war and many Kentuckians thought slavery may be safer in the Union than out of it. That belief was among the reasons Kentucky stayed in the Union and a sense of betrayal developed among some people after the Emancipation Proclamation became official and the 13th Amendment passed, adding to the "seceded after the war" stigma that became attached to the state. The 14th Kentucky Cavalry and the 3 Forks Battalion both served in the Eastern Kentucky region during their time in the war, battling Confederate guerillas. It was not a glorious time, but shows their support for the Union cause. I'm a descendant of Thomas Herald. Thanks for posting this. I've been trying to find this info. This is great. I'm a descendant of William Squire Bill Herald...Thomas and Alex's brother. Hello, My name is Arnold Arrowood. I am a descendant of Reverend Nathaniel Lewis Arrowood the Quarter Master Sergeant and later a private in the 14th Kentucky Cavalry Company K. Or known as the "Greasy Fourteenth". 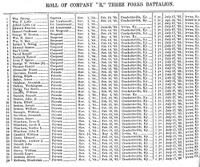 Company K was originally mustered in as the 14th Kentucky Cavalry, 3rd Battalion, Company B. It was later called Company K. I know my family married into the Heralds after the civil war, but am unsure when and whom. I wanted to share the information of the companies info with you as it confused me as well in my search, finding my 4x/5x Great Grandfather listed as being in two companies of the 14th.